I am so excited to be sharing my home with all of Debbie’s friends here at Debbiedoos! Thank you so much Debbie for inviting me! 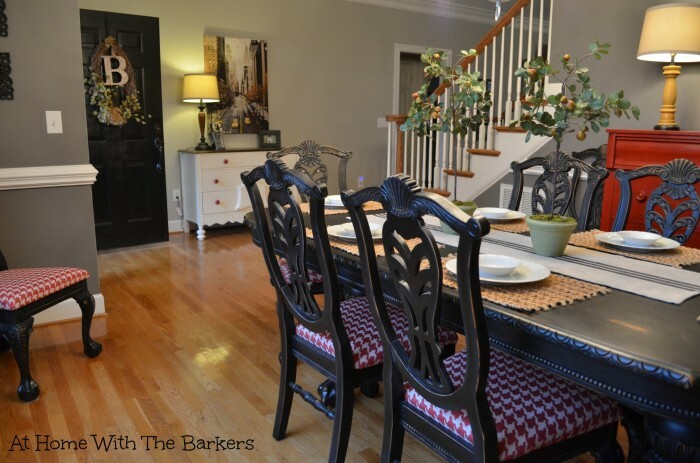 My name is Sonya and I write a blog called At Home with The Barkers. 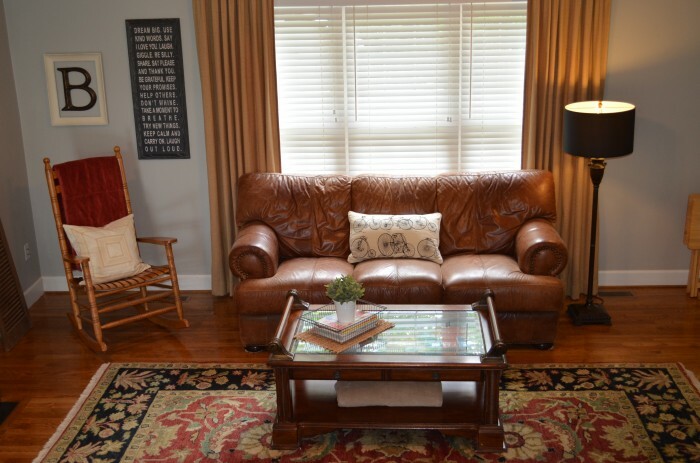 Our Southern Traditional home is a place where you are welcome to sit down and put your feet up. We live in the Upstate of South Carolina. My husband and I were born and raised here but moved away for 10 years. When we moved back home 6 years ago we were in search of house specifically in this school district. 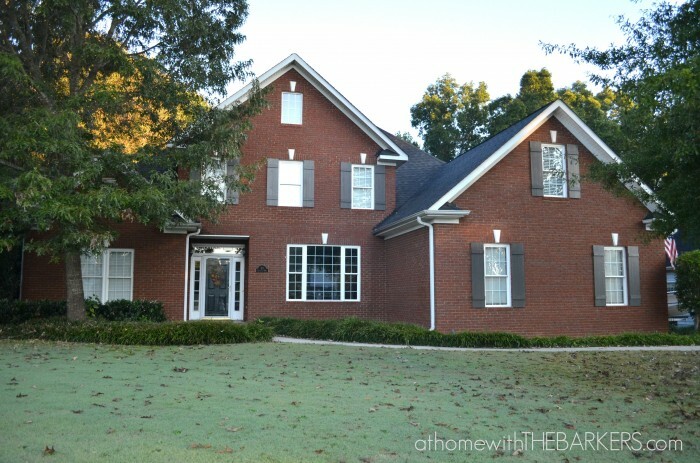 We were thrilled when we found Our Home in a great neighborhood 2 miles from the school. 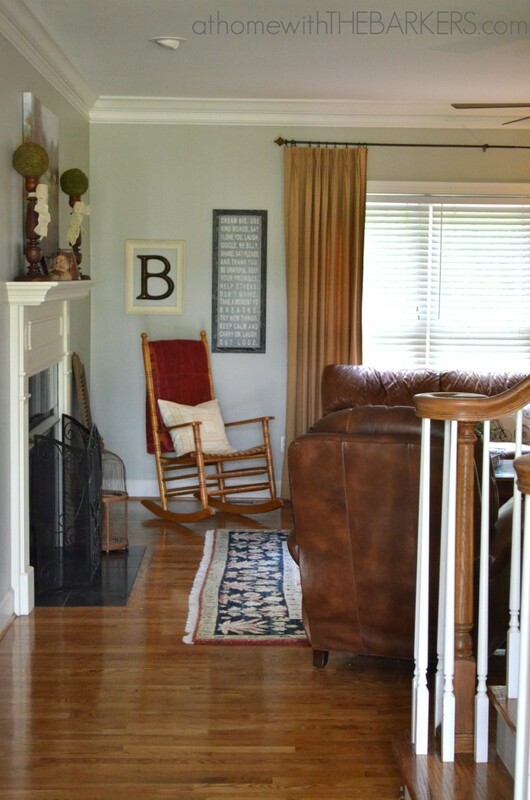 When you enter the front door you have a view to the Family Room. When you look to your right you will see the dining room. I painted my dining room table with spray paint, yep, sure did! 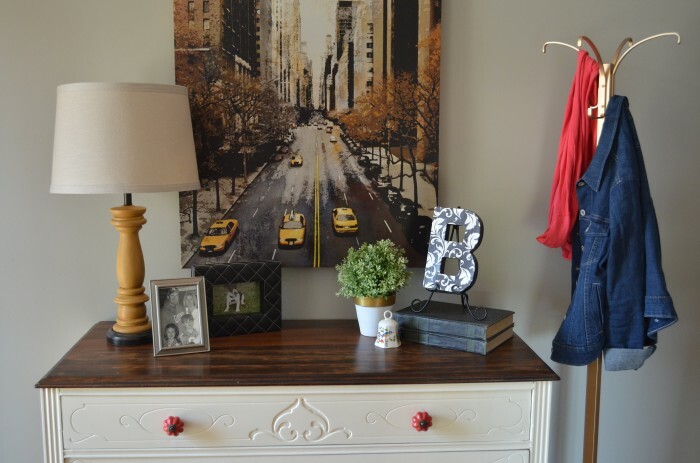 And that red dresser is another painted piece, painted with Annie Sloan Chalk paint. Although dining rooms are “suppose” to be formal, I’m not a formal kinda girl. This dresser in the foyer and items here get moved around all the time. This is our family room where we lounge and watch TV. I have had that sofa for 12 years and it is worn and perfectly comfortable. That bicycle pillow is a cute find from Home Goods and that coffee table, well she’s on the “to paint” list. 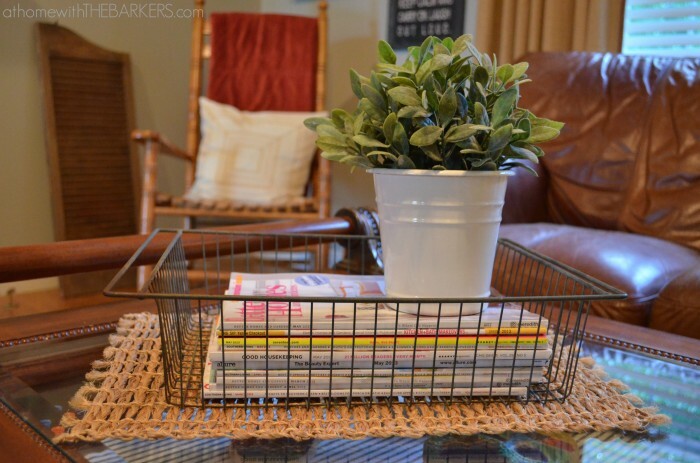 The magazine basket is one of my favorite thrifty finds. It was .50! 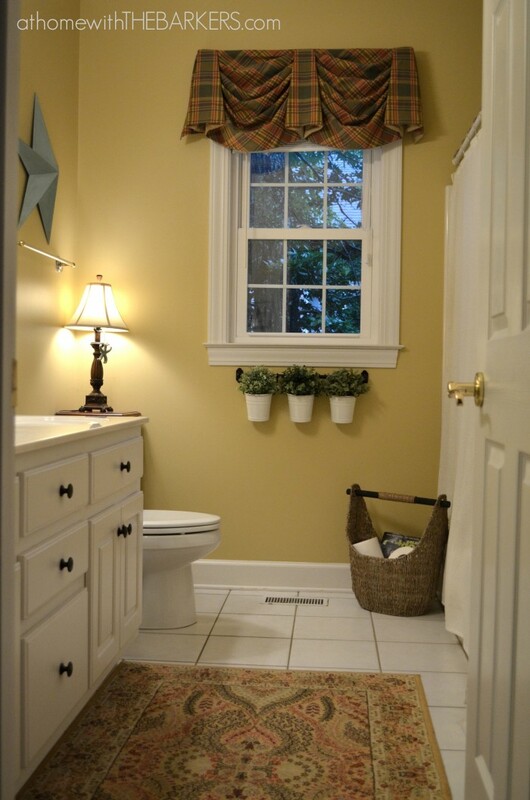 This is the downstairs bathroom that guests will use. The plantings under the window are actually from Ikea. It added a little fun to this bathroom. The kitchen is where I spend most of my day. I sit here at the table and use my laptop to blog. And my husband works from home so breakfast, lunch and dinner I’m still here! You can take a full tour of the kitchen before I painted it here and after I painted it here. And I also painted those cabinets myself…you can see that here. My husband put in the tumbled stone back splash! This summer my daughter and I did a makeover on her room. If you want to see it all you can go here. 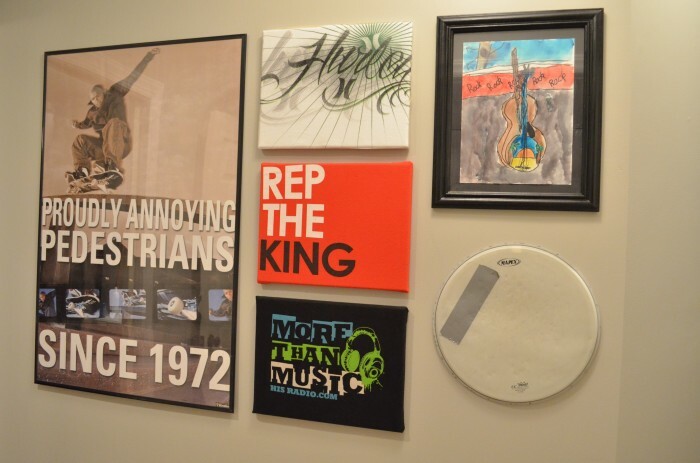 I love making art pieces…Paint, duct tape, t-shirts are all used and I love adding them to gallery walls. My daughters room above and below is the hall that leads to my sons room. 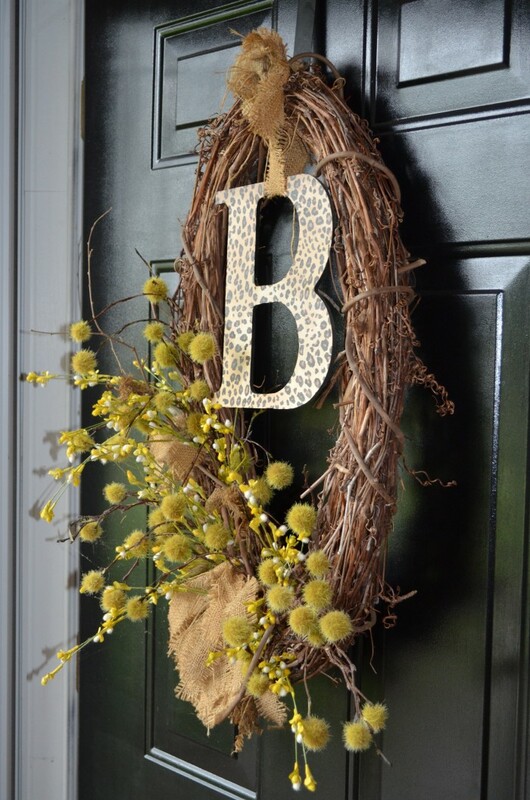 Feel free to visit At Home with The Barkers anytime and follow along with my DIY, crafting, and painting journeys. Be sure to say Hey and remind me we meet at Debbiedoo’s! What a great home! I love that the dining room table is spray painted!! It’s all so warm and welcoming with great pieces collected over time! Thank you so much! I love the table too. There’s so many things to love in this home! 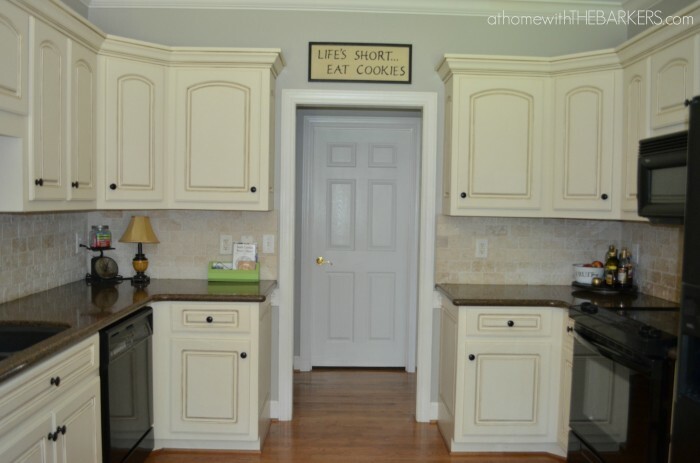 The “eat cookies” sign, the striped lamp in your daughter’s room, the red dresser…I could go on! Lovely! You are so sweet! I bought that sign a few years back at Home Goods. I love cookies, so I just had to buy it. 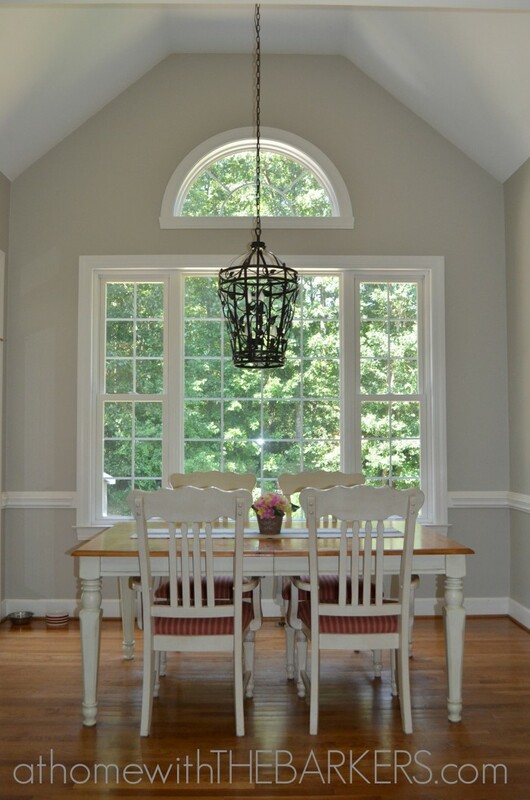 Such a pretty home and I do love Sonya’s dining room! So enjoyed the tour, thanks for sharing! Thank you Cindy, the dining room is my fun and bold room. Thanks so much Marty! I need color, it make me happy. Pretty home and love the bright room she blogs in. Thanks Kim…I have the best spot to sit and write! I love your home Sonya!! So very welcoming! 🙂 Thanks for sharing! I love your house it’s so casual and inviting. Beautiful. Thanks Christy…bought that rug at Sam’s years ago! Loved everything about this home!!!! This is such a welcoming from the front and right on through. 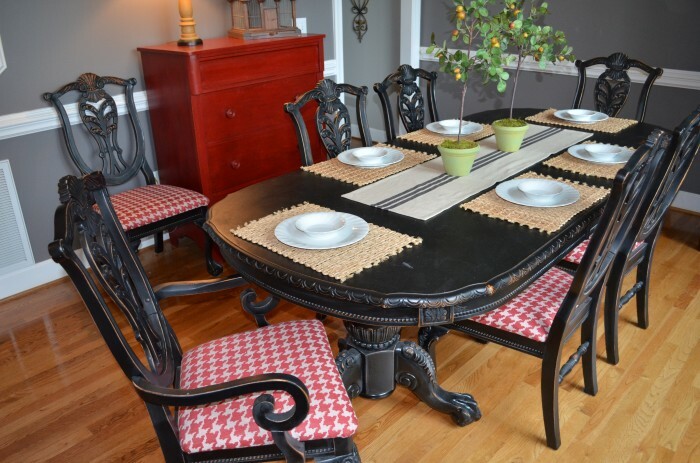 Love the dining room, the table is so pretty! Love this space! It is so warm and inviting. I think her gallery wall is so cute full of homemade, wonderful pieces! So pretty! I love her style. I especially LOVE that black table. Wow! I love this space,the painted table looks great,all the wall colors look so inviting.Enjoyed the tour..thanks. What a beautiful home! I so much enjoyed taking a tour and admiring all of the creative touches that Sonya has added to each room. What a gorgeous home and beautiful decor. Jealous!! Such a beautiful, warm and welcoming home! I love all the special touches and art work. Off to check the blog! What color did you use on the table and chairs that you spray painted?